Bank of America Luxury Credit Card Now Available! If you haven’t noticed, the so-called luxury credit card scene is getting pretty busy. In just the past few months, we’ve seen the unveiling of both the UBS Visa Infinite and the U.S. Bank Altitude Reserve credit cards to compete with the widely popular Chase Sapphire Reserve card. We even saw American Express retool their longstanding luxury offering by upping the annual fee to $550 on its flagship Platinum card. Now there’s news that Bank of America wants a piece of the luxury credit card market too and will be releasing a similar card later this year. The “Bank of America Premium Rewards credit card” is now live and can be applied for on their website. They currently have a “Cash Rewards” credit card, so the name kind of makes sense in that it’s to the point without any catchy buzz words. Anyway, the card comes with a 50,000-point sign-up bonus for spending $3,000 in three months, which is pretty high for Bank of America, which tends to only give away $150-$200 tops. Those 50k points are worth $500 if redeemed for cash or gift cards, and perhaps even more if you get a banking relationship bonus. The card does not allow points transfers to airlines and hotels, which is unfortunate but expected. Aside from the big opening bonus, cardholders earn 1.5 points per dollar on all purchases, aligning it with the likes of Chase Freedom Unlimited and Capital One’s Quicksilver. The difference is that the Bank of America Premium Rewards card also has a 2X category for travel and dining. It’s a broad category, and arguably one consumers use a lot. So that separates it from the crowd somewhat. Assuming cardmembers couple it with the bank’s “Preferred Rewards” program, the points can go even further. Here’s where it gets interesting. For those with $0.01 to $19,999 in Bank of America deposits, they’ll earn 2.2X points per dollar on travel and dining and 1.65X points on all other eligible purchases. For those with $20,000 to $50,000 in BofA deposits, they’ll earn 2.5 points per dollar on travel and dining and 1.875 points on all other eligible purchases. For those with $50,000 and $100,000 in BofA deposits, they’ll earn 3 points on travel and dining and 2.25 points on all other eligible purchases. For those with more than $100,000 in BofA deposits, they’ll earn 3.5 points on travel and dining and 2.65 points on all other eligible purchases. The big problem here is that the bank probably pays a minuscule yield on deposits, so you’re giving up a lot of interest in exchange for slightly higher credit card rewards. Whether that’s worth it is the big question. One could argue to keep your money at a bank where it earns the most money and use a credit card that earns solid rewards, even if they aren’t quite as high as this offering. This is especially true if you can get more out of the points by transferring them out to loyalty partners where the points are worth a lot more than a penny apiece. The one caveat is if you sign up for a Bank of America checking account bonus as well, and park your money for a few months while you earn the higher cash back multiple. At the lowest relationship tier, the 10% customer bonus means each $100 in cash back equates to $110 when deposited in a Bank of America checking or savings account. What Else Does the New BofA Card Offer? There is a $100 annual travel credit, similar to Amex Platinum and Chase Sapphire Reserve, along with a $100 credit for TSA Pre or Global Entry. 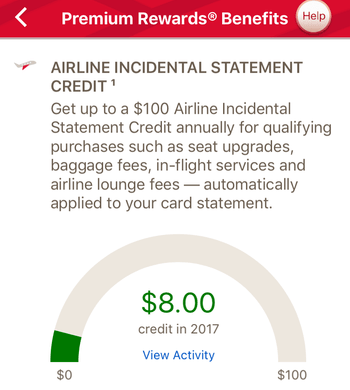 This $100 “Airline Incidental Statement Credit” can only be used for, you guessed it, incidentals, such as in-flight food and entertainment, baggage fees, seat upgrades, cancellation fees, airport lounge fees, etc. They specifically say gift cards, ticket purchases, award fees, and mileage point purchases will not work, but we’ll see. I find that a bit odd since how are we to know which airlines are covered here? I’m going to reach out to Bank of America for clarification so we know exactly what will trigger the credit. There are also no foreign transaction fees on the Bank of America Premium Rewards credit card either. In a sense, that means this new card is a sort of Sapphire Reserve and Freedom Unlimited hybrid, though lacking the very important Ultimate Rewards program. However, the annual fee is only $95 per year, compared to $450 for CSR and $550 for the revamped Amex Platinum, the same as Chase Sapphire Preferred. So Bank of America will surely win a lot of new customers scared off by those sky-high annual fees, but it might also challenge the profitability of the card. Giving away $500 or more in value and charging less than $100 doesn’t sound like a good deal for the bank. But they wouldn’t be the first ones to do it. Heck, the Chase Ink Preferred comes with $800+ in value for a $95 annual fee. While this new luxury card from Bank of America may not be earth-shattering, it could be an easy target to earn a nice sign-up bonus. And because it’s not a Chase card, those over 5/24 will be able to apply, which is handy for those running out of good options. I went ahead and bit since the 50k bonus points can be cashed out for $530 or so seeing that credit card rewards aren’t taxable. There weren’t many other cards out there that I wanted at the moment, so this made sense. Do note that there are some inferior 20k sign-up bonus offers out there for similar looking cards, so make sure you choose the right link when applying. The 50k offer is publicly available, you just have to track it down. The $95 annual fee can be absorbed via the $100 travel credit, and it’s a calendar year benefit. So if you apply now, you can ostensibly get it twice in less than 365 days. Bank of America has a $300 checking account bonus too, which is taxed, making it slightly less attractive considering the effort involved. But together it might be a nice little payday totaling close to $1,000. Previous Previous post: When Will the Credit Card Sign-Up Bonus Post to My Account? Next Next post: Should I Keep the Chase Sapphire Reserve Past Year One?